I purchased Sundari's Comfrey Cleanser for Vata (dry) Skin back in April, finished it in may, and I've put off writing this post because I'm still conflicted on what my final thoughts are on this exfoliating cleanser. 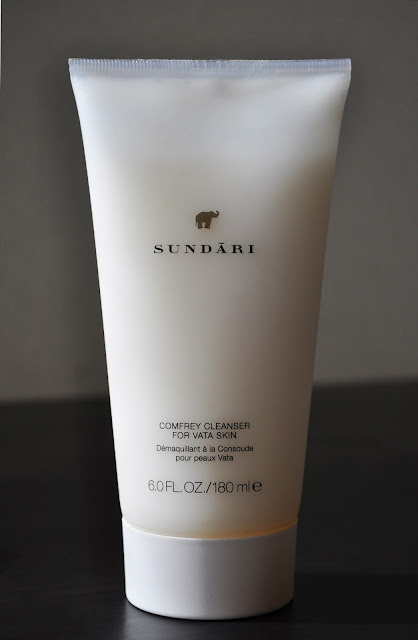 Admittedly, I was unfamiliar with the brand, and the sole reason for giving the skincare line a "go" was the little elephant logo on the packaging (elephants remind me of my mom), and the fact that Sundari does not test on animals. I loved the patterned print detail on the inside of the box. I think this print would look lovely as a throw pillow, area rug or kitchen tiles. The packaging has a luxurious, minimalistic look and feel with the frost plastic tube and sleek, somewhat weighty twist-off lid. Anthemis Nobilis Flower (Chamomile) Extract. Now, here's my conundrum with the cleanser: as an exfoliator, I found the grains to be quite large and sparse. Therefore, to get the amount of granules to my liking, and to feel as if I were getting the benefits of exfoliating, I had to use more product. As a cleanser, I found the milky white base (which doesn't lather) very moisturizing and soothing, and after use, skin did look great; it looked and felt soft, smooth, nourished and revitalized. In Japan, Sundari's Comfrey Cleanser for Vata Skin retails for 5,940 yen, and contains 6.0 fl oz/ 180ml. As much as I liked the results of the Comfrey Cleanser, the fact that I had to use so much of the product, and its price point, had me wondering if I will repurchase in the future. I love how it feels in my hands, very lux!